Keep up to date with your favourite motorsport events so you never miss a race. iOS. Android. Mac. Windows. Get your favourite motorsport events delivered straight to your calendar. 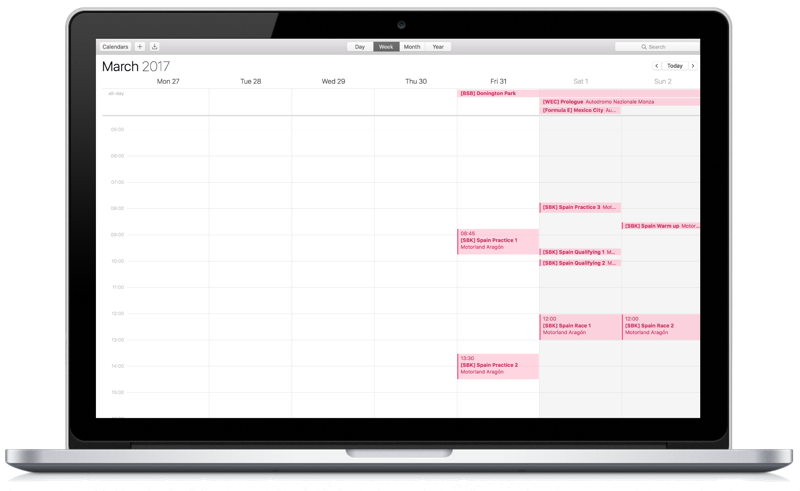 Select all the races you want to follow and your calendar automatically updates with each event. Choose dates only or, where available, full session times. Sessions are updated automatically as they become available so you can tell at a glance when the race begins in your time zone. Don't waste time finding and updating different racing calendars. Rushsync keeps track of all the events for you. Any updates are automatically pushed to your calendar. Session times are automatically displayed in your time zone. If you follow more than one motorsport series it can be hard to keep track of what is on when. Add Rushsync to your calendar and see at a glance what time qualifying and race sessions start so you can plan your weekend. Motorsports people, you need @rushsync in your life! If you don’t use @rushsync to manage your motorsport calendars you really should. Brilliant. If you watch any motorsports, like F1, BSB, MotoGP or WRC then @rushsync is the place to get the dates! You can add them to your calendar. Join thousands of other motorsport fans who sync their calendars with Rushsync.